Ships tomorrow if ordered in the next 4 hours and 37 minutes! 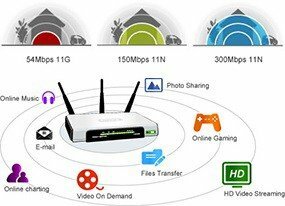 The TL-WR940N creates a wireless network with speed of up to 300Mbps and has 4 10/100M ports to support 4 wired devices. With three omni-directional antennas, the router adopts MIMO (Multi Input Multi Output), CCA (Clear Channel Assessment), and SST (Signal Sustain Technology)technologies to deliver optimal wireless performance, transmission rates, stability, and coverage. Hence, the router allows you to simultaneously enjoy multiple bandwidth-consuming applications like streaming HD video, making VoIP calls, sharing large files and playing online games. The TL-WR940N features Wi-Fi Protected Setup (WPS) which allows you to set up a secure wireless connection without manually inputting the password. In order to use this function, you need to have another device such as a wireless adapter or range extender that also supports WPS. By pressing the WPS buttons on both devices, they can connect to each other. With Quality of Service (QoS), you can control how much bandwidth is allocated to each user. This ensures optimum utilization of bandwidth by controlling congestion and preventing bandwidth abuse. This way users in a network will receive committed and specific bandwidth, preventing non-critical applications from degrading network performance. The TL-WR940N comes with a Quick Setup feature in its web management page that leads you through a step-by-step process to set up your router. You don't need to install any software or use a CD to finish the setup. Within minutes, your router will be up and running. Every product comes with our 100% satisfaction guarantee. If you are not happy after initial inspection with quality, materials, or workmanship, Please fill out an RMA request to have your order returned, only returnable up to 14 days from the order date. Nikastic.com does not provide return labels for this particular item. Buyer will be responsible for returning package. Review "TP-LINK TL-WR940N Wireless N300 Home Router, 300Mpbs, 3 External Antennas, IP QoS, WPS Button"